BMW launched their newest 3-series sedan at the Paris Motor Show last week, which is a pleasant, but not overly dramatic evolution of the outgoing car. 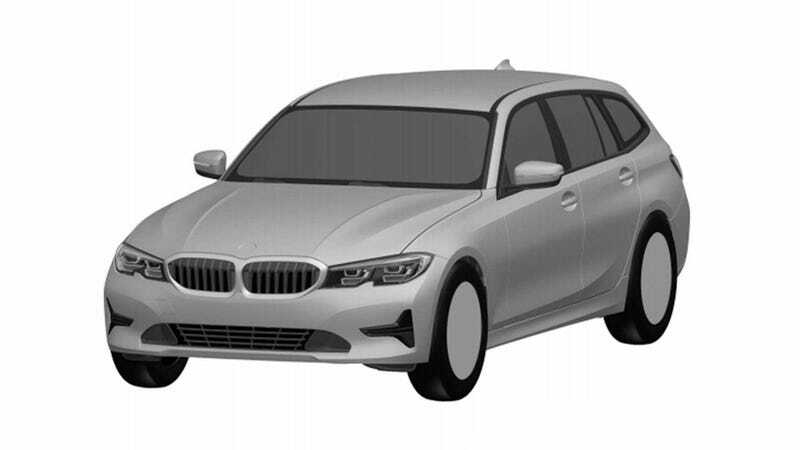 Recently, found in design registration documents filed with the Brazilian government by QuatroRodas, the 3 Series Touring wagon was leaked to the world. It’s an aggressive yet simple redesign, and will surely be the non-SUV choice of New England upper-middle-class suburban moms. It’s not too surprising that a wagon version of the 3 Series would be coming down the pike, as BMW likes to have many different body variants of the same chassis.I wouldn’t be surprised to see the hatchback Gran Turismo, the 4 Series coupe, the 4 Series convertible, and the not-a-coupe 4 Series Gran Coupe teased in the next few months. While the current Sports Wagon variant is only available with a 4-cylinder and mandates all-wheel drive, there is no way of knowing which variants will be optional in the U.S. market, or if the wagon will even be sold here. We hope, like the sedan, the wagon will be available in 330i and 340i variants with a 255 HP 2.0-liter turbocharged inline-four, and a new 382 HP straight-six, respectively. The xDrive all-wheel drive is likely to remain standard, especially helpful for markets where the weather gets inclement. Also like the sedan, don’t expect a manual transmission option. The current Sports Wagon carries a $2,750 price premium over the sedan of the same spec. The new 330i xDrive is expected to start at exactly the same price as the outgoing example, which hopefully means the wagon version would also retail for about the same $45,000 price as the current model. For the real specs, we’ll just have to wait until BMW makes them official. In the meantime, you can spend the rest of your day staring at these computer drafted mock ups of the wagon.